Ghana goalkeeper Richard Kingson turned goal scorer in Dar-es-Salaam on Wednesday, as he rescued a draw for the Black Stars against Tanzania. The visitors, under their new coach Milovan Rajevac for the first time, were trailing one-nil with seven minutes to go. They won a free-kick outside the Tanzanian area, and Kingson came up to help. He took up a position in the Taifa Stars' wall and rose to head home a perfect free-kick, delivered by none other than his brother Laryea. 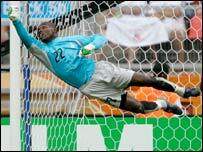 Earlier Henry Joseph had put Tanzania into the lead, as he headed home a Juma Jabu cross in the 34th minute. Playing without most of their Europe based players, Ghana barely threatened for much of the game. 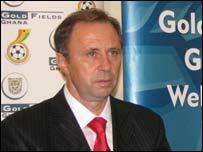 Milovan Rajevac expressed satisfaction with the result. "I don't think my players have played badly, I have just taken over and I am still trying different formations," he said. Tanzanian coach Marcio Maximo said it was a good learning experience. "It was a good lesson for the boys, we are gaining good experience by playing top teams like Ghana," he said. The match aided Ghana's preparations for their World Cup qualifier against Libya next month, while Tanzania, who are without any hopes of qualifying, are preparing to face Mauritius.